Many Wellesley students spend their junior year jetting around the globe, but six cinema and media studies majors decided to stay a bit closer to home. Abra White, Gladys Raygoza, Adrienne Ogle, Katie Barsotti, Lilly Tyson, and Ayana Aaron (left to right in photo, all class of 2015) have dedicated their spring semester to a unique program called Movies from Marlboro. Born of a partnership between Kingdom County Productions and Marlboro College in Vermont, the program brings college students to work with young film professionals to create a real feature length film. Principal photography for the film Peter and John, starring Jacqueline Bisset and Christian Coulson, began on April 3 on the island of Nantucket. Six Wellesley students and about 20 students from other schools have been hard at work on the set and behind the scenes. 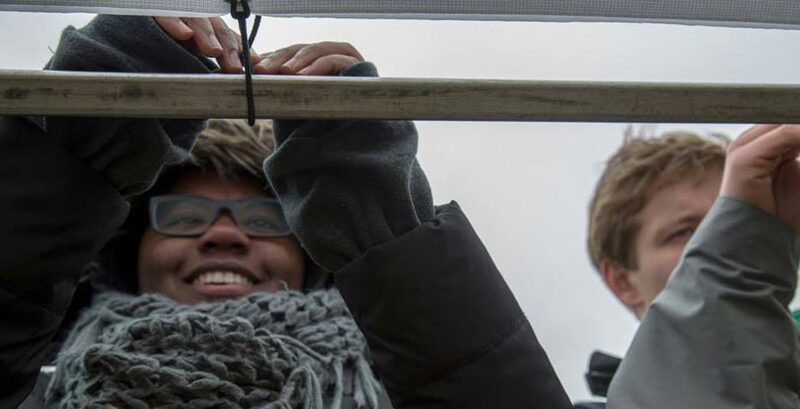 They aren’t relegated to positions of fetching coffee or directing traffic, as one might imagine of film intern situations, but instead work in meaningful crew positions that offer an opportunity to gain real-world film experience. The Wellesley students on the project are fulfilling a variety of roles across many departments. Katie Barsotti and Ayana Aaron are currently directing the behind-the-scenes documentary; Adrienne Ogle has a position in the post-production (editing) department; Gladys Raygoza is working in the camera as well as grip and electric departments; Lilly Tyson is acting as director Jay Craven’s personal assistant; and Abra White, who previously served as a casting director, currently has a key position in the production management department. The Nantucket filming will continue through May, with the projected release of the movie in the summer of 2015. The production is still in the process of fundraising, in part through Kickstarter, which provides more information about the production in addition to the opportunity to donate.